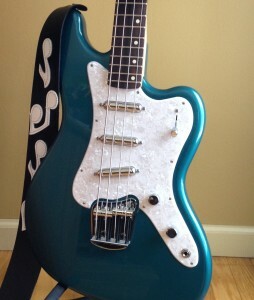 I had to sell my Epiphone Les Paul Standard and roll up a whole bunch of quarters, dimes, nickels and pennies to afford this Fender short-scale bass, which I bought yesterday at the House of Guitars in Rochester. This instrument has more tonal options than can be counted; it's possible to play with any combination of the three pickups (or any single pickup) and then fine-tune the sound with the tone knob. 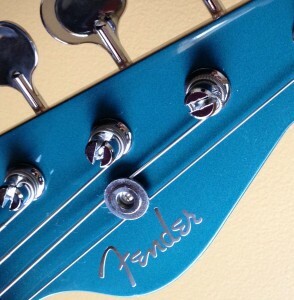 It's got a comfortable, fast neck, and the action is like my Gibson SG-3, which I love. Nice! Glad you're back at it. No sense having all this gear around if it's just going to sit in the case. Really gorgeous guitar -- looks like one you'll enjoy playing. Thanks. Unlike the Les Paul, this one is more liberal in letting me play good notes. Would you ever consider giving us an audio post of your work? That is a beauty. 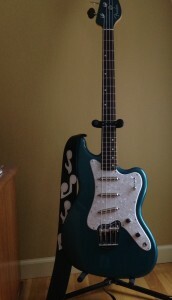 Sadly, my basses look far better than I play. Kind of you to ask, though.